"Eric Schlosser's Fast Food Nation is a good old-fashioned muckraking expose in the tradition of The American Way of Death that's as disturbing as it is irresistible....Exhaustively researched, frighteningly convincing....channeling the spirits of Upton Sinclair and Rachel Carson....Schlosser's research is impressive--statistics, reportage, first-person accounts and interviews, mixing the personal with the global." 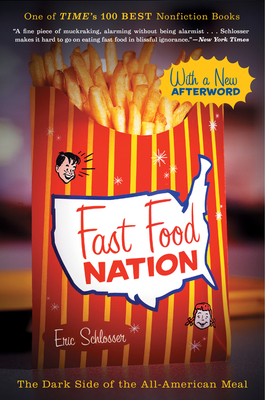 "'Fast Food Nation' is investigative journalism of a very high order. And the fit between the author's reporting and his narrative style is just about perfect. The prose moves gracefully between vignette and exposition, assembling great quantities of data in small areas without bursting at the seams." "Reminiscent of Upton Sinclair's 'The Jungle'....."
"'Fast Food Nation' should be another wake-up call, a super-size serving of common sense...."